Water, our most precious resource. Over the millennia, great civilizations have both flourished and perished due to the availability of water. Today, industrialized societies are still, and possibly more so, dependent on reliable water supplies. In Missouri , each person uses about 75 gallons of water per day for household and other domestic uses. Even with more efficient use and other conservation efforts, as the population increases, so does the need for water. The amount of water on Earth has essentially never changed. It is continuously being recycled, moving from one storage place to another, including lakes, streams and oceans, underground, in glaciers and ice caps, plants, and in the atmosphere. This recycling movement is called the water or hydrologic cycle. 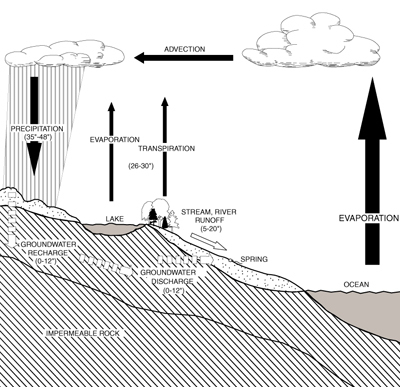 The hydrologic cycle explains the exchange of water between the atmosphere, ground and surface of the Earth. The hydrologic cycle is perhaps the most important natural phenomenon on Earth; it is the driving force behind most other natural processes. The movement of water through the cycle annually replenishes our water supplies, thus making water a renewable resource. This replenishment takes place throughout the year, but is more pronounced during the spring. 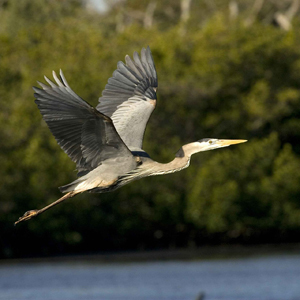 The hydrologic cycle is an ever fluctuating, dynamic system. Small changes often occur in the quantities of water located in the various segments of the cycle. Many of these fluctuations relate to seasonal changes. For example, the amount of rainfall, the effect of temperature on evaporation, and the uptake of water by plants during the growing season all affect how much water will be available in any segment of the water cycle. Thus, the movement of water in the cycle is always changing. Even small changes in the cycle at a regional or local scale may look like large changes to us as in the form of droughts or floods. A water budget is used to understand its effect on local water resources and to predict or estimate quantities of available water from surface or ground water sources. The water budget for Missouri is illustrated above. The Bonne Femme Watershed averages about 39 inches of precipitation a year. Of this, 9 inches run off the land surface to streams and rivers, and the remaining 30 inches is returned to the atmosphere through a combination of evaporation and transpiration (the process where water that passes through a plant's pores back to the atmosphere). The hydrologic cycle assures a reliable, although fluctuating, water supply by annually replenishing, or recharging, both surface and ground water sources. When water removal (evaporation, transpiration, water supply, etc.) exceeds replenishment (precipitation), water levels fall as usually observed during the summer and fall months; conversely, water levels rise when replenishment exceeds removal, usually during the winter and spring months. The middle parts of the Bonne Femme Watershed contain karst landscape, a veritable geologic ‘swiss cheese'. This landscape contains caves, springs, sinkholes, and losing streams. These features make the watershed unique and provide wonderful recreational activities. 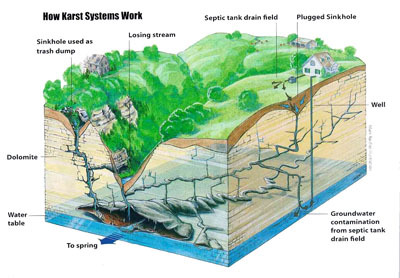 The groundwater in karst areas is particularly sensitive to pollution since surface water bypasses any filtering of contaminants typically provided by soil. Karst is formed by the dissolving action of carbonic acid. When rain falls through the atmosphere and percolates through the soil, it absorbs carbon dioxide (CO2) from the air, thereby forming a weak solution of carbonic acid (H2CO3). When this solution reaches bedrock, it flows through cracks in the bedrock. If the bedrock is carbonate (such as limestone), the cracks are gradually enlarged by the dissolving nature of the solution, forming larger and larger conduits for the solution to pass through. Over time, caves and other karst features are formed. Caves: Natural cavities beneath the surface of the earth. In karst regions, caves are created by groundwater dissolving rock. Losing Streams: Losing streams lose part or all of their flow to the groundwater system by suddenly disappearing underground. The upper Bonne Femme Creek is a losing stream, and provides much of the water flowing through the Devil's Icebox. This inter-watershed transfer of water connects the Bonne Femme and Little Bonne Femme Watersheds. Natural bridges: Arches that are the remnants of collapsed caves, usually fairly short. Rock Bridge is one such natural bridge. Sinkholes: Rounded depressions in the landscape. Sinkholes are often collapsed caves and can be quite deep, or they can be shallow holes. Sinkholes collect surface water running off the surrounding land, and the runoff goes directly into the groundwater. The Pierpont Sinkhole Plain (the area surrounding Pierpont) contains numerous sinkholes easily visible from the road. It is called a plain since there are no creeks formed from runoff since it all goes into the sinkholes. 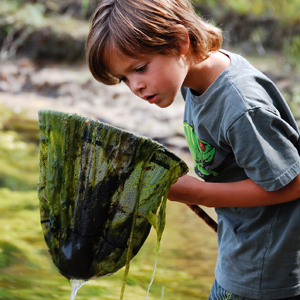 Springs: Natural resurgence, or discharge, of groundwater from rock or soil to the surface.